An online gambling company has been reprimanded by the Advertising Standards Authority after one of its brands posted a tweet featuring a derogatory comment alongside a photo of the star of ITV's Loose Women in swimwear. It read: "You can put lipstick on a pig, but it’s still a pig. #LooseWomen18". 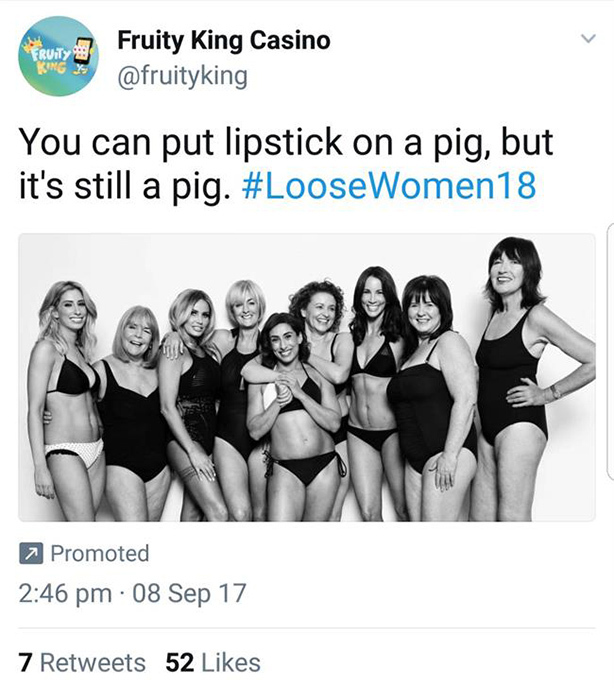 The brand, Fruity King Casino, is owned by ProgressPlay, but the company said the brand was operated by a licensee, which had published the tweet. Responding to the charge of sexism, the brand operator said the tweet was not derogatory towards women, but rather was meant to make reference to Loose Women as a low quality TV show. But the watchdog said that viewers would understand the image to portray a positive image of women’s bodies, and the text to ridicule that idea. It ruled that the tweet breached the CAP Code rule on causing harm and offence, and told ProgressPlay to ensure in future its advertising was not derogatory towards women.